When we moved into our last house, I was thrilled to find out we had a mature wisteria in the garden. 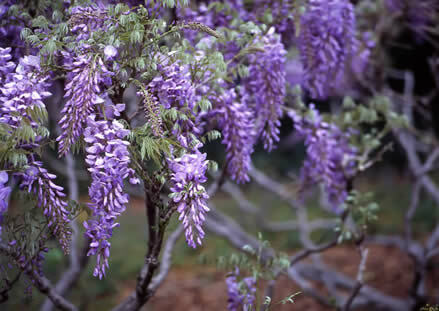 If you aren’t familiar with wisteria, it is a magnificent flowering plant, somewhere between a vine and a shrub. And a purple and flowering anything is my favorite. I couldn’t wait for to see it in its full glory! Except mine did NOT flower. I tried everything. I cut it back, I fertilized, I amended the soil, I read everything I could get my hands on, I consulted experts, but to no avail. Nothing worked. No flowers. What I DID get was an invasive vine that devoured everything in its path. Covered in thick green leaves, it looked healthy and grew like a weed. The roots were deep and thick, sending up shoots all through the bed it inhabited, crowding out the other plants I attempted to grow. It clung to the walls of my house and eventually started doing damage to the roof. After a few seasons of attempting to coax flowers from my unruly guest, I admitted defeat. My wisteria, once so full of promise, did nothing but cause damage to my garden and home. It had to go. It took a whole gardening season of chopping, digging, pulling, and poisoning to eradicate the tenacious vine. Although it looked healthy, it did not do what it was designed to do. I thought of my wisteria vine this morning when I was reading about the week leading up to Jesus’ death and resurrection. I’ve always been intrigued and somewhat confused by the story of Jesus cursing the fig tree after his entry into Jerusalem. According to the accounts in both Matthew and Mark, the fig tree that Jesus encountered appeared healthy, covered with green leaves. Like my wisteria, however, the appearance of the tree was deceiving. Seemingly healthy and full of life, the tree bore no fruit. And what good is a fig tree with no figs? Here is a clue to why this fig tree should matter to us. Each time, the story of Jesus cursing the fig tree appears right next to the account of Jesus turning over tables in the temple. When Jesus saw the money changers desecrating what was meant for holiness, He drove them out of the temple. In both these stories, our kind and usually patient Lord seems to be uncharacteristically punitive and angry. He has had it. But after all, what good is a house of worship where there is no worship? Throughout the gospel accounts, Jesus’s harshest words were aimed at the empty religion of those who put on a good show, but were clearly missing the point. He was done with those who said all the right things, but whose hearts were far from God. What good is religion that bears no fruit? As Jesus approached the cross, He knew it was time to make sure that the disciples didn’t miss the point. This was the final week of His earthly ministry. He didn’t have much time left to make sure they understood what was about to happen. The withered fig tree and the turned over tables told the story. This wasn’t about religion or rule following or temple attendance. Their relationship with Him was meant to bear a very particular kind of fruit. Jesus’ life, death and resurrection was about an otherworldly, sacrificial, life-changing, restorative, reconciling, Kingdom kind of love. A love that was meant to change the world. 2000+ years later, our relationship with Him is still supposed to bear a very particular kind of fruit. His life, death and resurrection is still about an otherworldly, sacrificial, life-changing, restorative, reconciling, Kingdom kind of love. A love that is still meant to change the world. Here is the question I am asking myself this Holy Week: what good is living my life for God, if it doesn’t look like THAT kind of miracle working love? Am I bearing the fruit for which I am designed?